Living Cully is an innovative collaboration that formed in 2010 between Habitat for Humanity Portland/Metro East, Hacienda Community Development Corporation, Native American Youth and Family Center, and Verde. 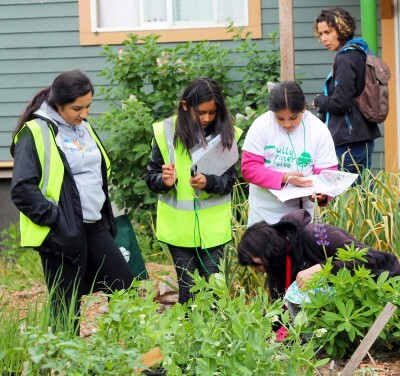 Through its work in NE Portland’s Cully Neighborhood, Living Cully reinterprets sustainability as an anti-poverty strategy by concentrating environmental investments at the neighborhood scale and braiding those investments with traditional community development resources. Click on the video, below to learn more about Living Cully! Only 34% of Cully streets have sidewalks, 24% of residents live within ¼ mile of a park (regional average is 49%) 85% of Cully students qualify for free or reduced lunch and the poverty rate is 17% higher than the citywide rate of 13% (US Census 2010). Cully was annexed into the City of Portland in 1985 without basic infrastructure, facilities and services. Since then, investment in Cully’s sidewalks, roads, family oriented businesses and other amenities has lagged behind the rest of the city. Over the past 30 years working families from many different cultures have moved to Cully making it the most diverse census tract in Oregon. Hacienda CDC, Verde and Native American Youth and Family Center (NAYA) are strong Cully-based organizations with a rich history of working together and complementary strengths and activities. Living Cully formalized these strong partnerships into a collective impact model in 2010, adding an additional partner, Habitat for Humanity Portland/Metro East in 2012. Together Living Cully partners create economic, ecological and social benefit for Cully residents, particularly low-income and people of color, by: increasing job opportunities and building earnings for residents and neighborhood small businesses, providing opportunities for engagement, collective action and cultural expression, expanding safe, high-quality affordable housing in the neighborhood, increasing natural and built investment including parks, trails and healthy housing, and to working to ensure low levels of involuntary displacement from the neighborhood.